Looking for a fast and easy way to come up with great ideas as a team? The Brainstorming Sprint engages participants in a series of activities designed to generate, vote on, and optimize ideas, all in a week or less. Get a group together to explore a specific problem or need and brainstorm solutions. Use text, photos and/or video to build your ideas, then have the group vote on the favorites and provide input to optimize those top ideas. 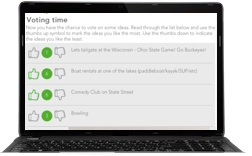 Digsite participants use a combination of discussion, voting and image mark-up to create and optimize ideas. A major home and auto insurance company wanted to tap into their customer base to brainstorm names for their new insurance storefronts. The insurance company turned to a Digsite 1-Day Sprint for an agile and cost-effective way to gather feedback from their target audience. 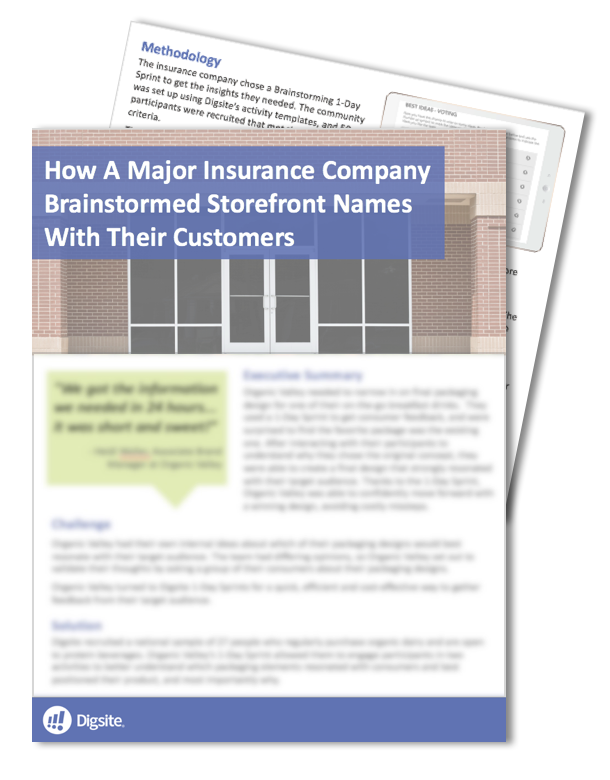 They were able to interact with participants multiple times over the course of 24 hours to get the actionable insights they needed to refine their insurance storefront naming ideas.